Chosen specifically for the corporate executive, this collection of finely crafted gift items are perfect for any executive or person in management. Our Executive Gift Awards section is a Truly elegant collection of clocks, desk items, crystal, art glass, and functional gifts. Each Executive Gift Award can be personalized with your custom engraved text. 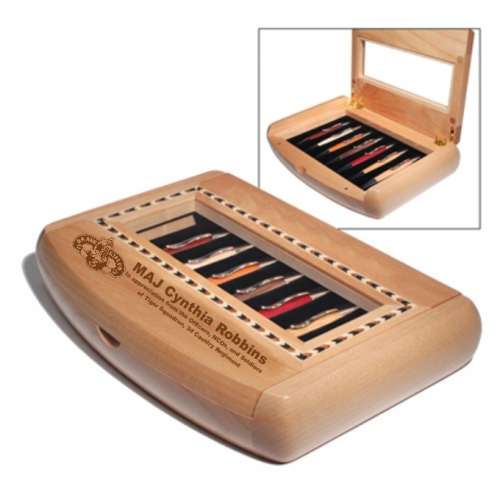 This Pen Set is crafted from Maple and features inlaid wood on the cover. A set of seven ball point pens complete this extraordinary pen set. A twist of the pen barrel reveals the smooth writing ball point. This is a wonderful gift for any occasion. Laser engraving reveals a warm brown tone providing excellent contrast.